When you are in a hurry, you don’t pay much attention to the objects around you. You fuss around trying to get things done, but it is exactly in those moments that accidents can happen: you knock over the coffee cup or trip over your laptop’s charging cord. And then hell breaks loose. What if we told you there were specially designed devices to prevent such accidents? Well, the new Breaksafe magnetic USB-C Power Cable from Griffin is such a device. This MagSafe cord saves your laptop from destruction when you trip over its power cord. BreakSafe does not support data and video, it can only be used for USB charging purposes. But since Griffin has already implemented this technology, we expect to see a MagSafe cord for with data and video support in the near future. The quick-release magnetic connector plugs into your laptop’s USB-C port and disconnects from the rest of the cable as soon as stress or strain is applied. 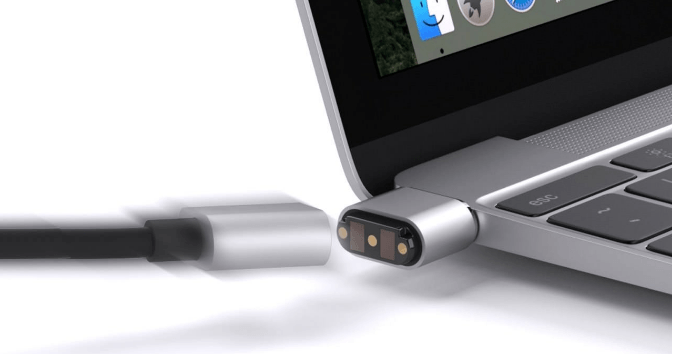 The magnetic connector is 12.8 mm deep allowing you to leave it plugged into the USB-C port even when you are not using your laptop. BreakSafe is compatible with Apple’s MacBook and other devices that charge via USB-C. As far as power standards are concerned, it is rated up to 60 watts (20 volts at 3 amps) power. The cable has a total length of 6 ft./1.8 m, allowing you to use it even when you are laying on the couch. […] the connectors are sometimes inadvertently decoupled due to an accident such as when a person trips over a cable attached to the connector. These inadvertent decouplings can result in a broken connector or even damage to the connected electronic device such as by pulling a lap top computer off of a table and causing it to drop to the floor. If the plug is designed to be easily removed from the receptacle to prevent this type of damage, the plug may not maintain satisfactory electrical contact between the electrical contacts in the plug and the receptacle. Another problem with prior art connectors is that uncoupling the plug from the receptacle often temporarily breaks the connections between some of the electrical contacts in the plug and receptacle while leaving other electrical contacts connected. This can lead to surge currents in the device when the plug is disconnected from the receptacle that may damage the electronics associated with the device. Therefore, what is needed is an improved connector. BreakSafe has a price tag of $39.99 and you can buy it directly from Griffin.